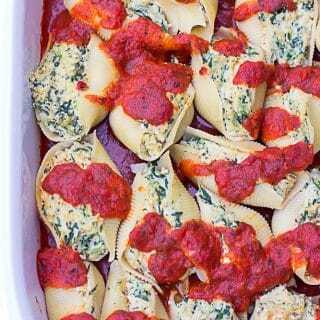 Stuffed with a cashew-tofu spinach ricotta, Vegan Stuffed Jumbo Shells are a crowd-pleasing and classic pasta dinner that even the pickiest kids couldn’t turn down! It’s filled with healthy fats and a good serving of spinach. Use your favorite store bought marinara or make your own if you have the time. 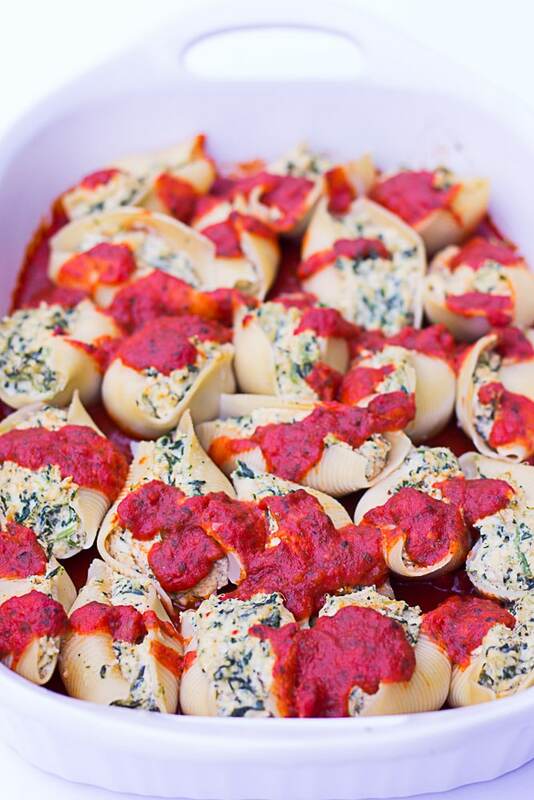 Meet my new favorite dinner: Vegan Stuffed Jumbo Shells with Spinach! 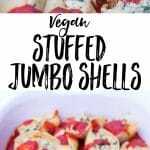 These Vegan Stuffed Jumbo Shells have been such a hit at my house lately. I even ended up making them on Christmas Day alongside a tasty Caesar Salad (recipe coming soon!) and roasted brussels sprouts. Serve alongside a large salad, if desired. 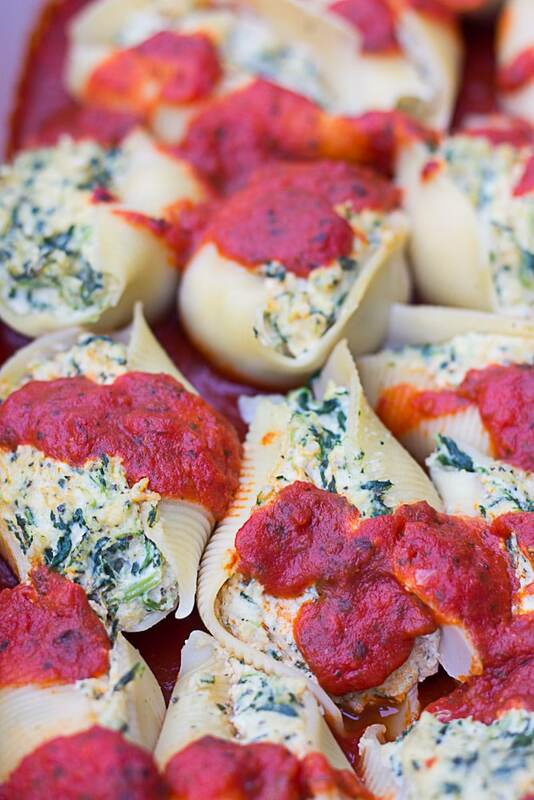 Stuffed with a cashew-tofu spinach ricotta, these jumbo shells are a vegan version of the classic pasta dish. This meal is crowd-pleasing, family friendly and oh-so-satisfying! Boil the Shells: Bring a large pot of water to a boil and add the jumbo shells. Cook for 8-10 minutes, until done. Drain and rinse with cold water. Set aside. Some will likely break, but you will only need about 3/4 of the package so that is okay. Make the Spinach Ricotta: Add the cashews to a food processor, and process until fine and crumbly. Now add the rest of the ricotta ingredients EXCEPT the spinach. Process until smooth and creamy, scraping the sides as needed. Now add the spinach, squeezing out excess water before adding. Pulse to combine. In a large casserole dish, evenly spread about 1 cup of the marinara sauce in the bottom. Stuff the Shells: Scoop about 2 tablespoons of the spinach ricotta into each shell and place open side up into the baking dish. Repeat until all the filling is used up. Spoon remaining marinara sauce on top of the stuffed shells, and place in the oven. Cook for 25 minutes. -I like Trader Joe's Tomato Basil Marinara, but use your favorite. Just check the label to make sure it's vegan (and oil-free, if you are avoiding it). -To make this lower fat, use 2 blocks of tofu and omit the cashews. -These make excellent leftovers and will keep for 3-4 days in the refrigerator. I think this is my new favorite dish!!! I would love to serve this to my non vegan friends and family! My entire family of 6 absolutely loved this dish! Thank you! Aw I’m so glad you all enjoyed it! It’s a great recipe for pleasing non-vegan friends and family. Thanks so much for sharing! Could this recipe me made ahead so I can prep during the day and just throw it in the oven right before everyone gets home? Thanks for the quick response. I’ll get started on tonight’s dinner then! This recipe was amazing! The entire family loved it! I am looking for dinners I can freeze (and keep frozen) and take on a 9 hour road trip to our vacation house. Do you think this is one that would freeze well? I’m glad to hear everyone loved it! These do freeze well, that’s a great idea. Thanks for the feedback Jennifer! Oh sure Jennifer! You could do it either way. Make the recipe to the point of baking and freeze, or freeze the filling separately, thaw and then proceed. I’ve frozen the leftovers too and that worked just fine. I would thaw it before transferring to the oven. Hope that helps! Are the cashews supposed to be soaked first?? No, for this recipe there is no need to soak the cashews first. You could, but I actually prefer the texture of the ricotta when they are not soaked. This filling will make GREAT Lasagna Roll-Ups! Thank you!! I’m making this dish for Easter for my parents and daughter’s boyfriend. It’s a favorite of ours. Adding a salad and baguette. I love your recipes, Nora. Thank you so much Sherri! Happy Easter! Made this over the weekend, it was SOOOO GOOD! 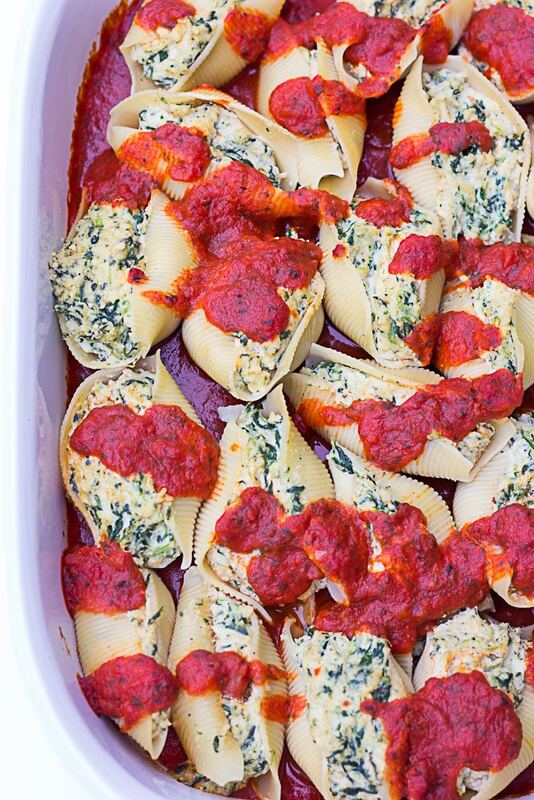 My husband could not believe how good it was and how much it tasted like ricotta stuffed shells. We spent the whole meal going “this is so good” ?? definitely going on the rotation! Had the family over, kids and adults loved them. Used more tofu and less cashews because that’s what I had, very very yummy. So glad to hear it, thanks for sharing! I didn’t rate it in the first comment. Five stars for sure. This dish is still cooking in the oven. I cannot wait to eat it! The filling is one of the best things that I have ever eaten! Hello. My children are allergic to soy. Would I be able to replace the 14oz tofu with 1 cup of chickpeas instead? Thanks for the recipe! Looks yummy. Hi Jenny! You could try it with chickpeas, but it would probably taste much better if you just used more cashews and left out the tofu. I’d suggest 1 cup more cashews, and then add more water as needed to make it nice and smooth. Chickpeas might work too, though, I just haven’t tried it! Thanks, hope you enjoy the recipe! I haven’t actually made anything with tofu yet but I know sometimes you need to prep it by draining and/or pressing liquid out. Do you need to do that w this recipe? No you don’t need to worry about doing that with this recipe. It just gets blended up with the other ingredients. This is a good introduction to tofu, as you really can’t taste it at all. 🙂 Hope you enjoy! Absolutely DELICIOUS! Didn’t have shells but had everything else so used rice pasta and mixed “ricotta” with noodles and layered with sauce. Mmmmm that sounds good Barb, so happy you enjoyed it! This dish is amazing!! My teenagers were very impressed and pleased with the results! I am a new vegan and love lasagna.. thank you for this recipe as I can still enjoy my favorite foods without compromising the flavor I’m used to! So glad everyone enjoyed the recipe! That is my goal! I made traditional ricota and beef shells also and this vegan recipe was the favorite! It’s nice to have another meal that will please everyone, saves time and is so much better for them! Thank you Melissa! I’m so happy you liked the recipe so much! It’s everyone’s favorite recipe around my house. This is great! I was skeptical at first but wow, it is good!! Vegans and omnis devoured it! Will make again. Thanks for this recipe! Tried this recipie but used a combo of tofu and cashews, it was very good! Also added a few more seasonings. I’m planning on preparing this tomorrow. Could i use fresh spinach instead of frozen? Yes, you can, I’ve used both and either way is great. Enjoy! do you think a blender could be used instead of a food processor ??? Yes, I think that would work pretty well. You may need to add a little extra water to get it to blend enough, as the mixture is quite thick. A “pulse” option on a blender would work quite well, especially for incorporating the spinach. Thanks! Do you have to soak cashews first? No, you do not have to soak the cashews for this recipe. Could you make this recipe with manicotti, do you think? Yes I think that would be delicious! Thanks for the recipe, it’s delicious! Just a handy little tip… rather than using a spoon to fill the shells, scoop all the filling into an icing bag or a large Ziploc bag. If using a Ziploc bag, cut a small tip off one corner for a makeshift icing bag. Then just squeeze the filling into the shells.